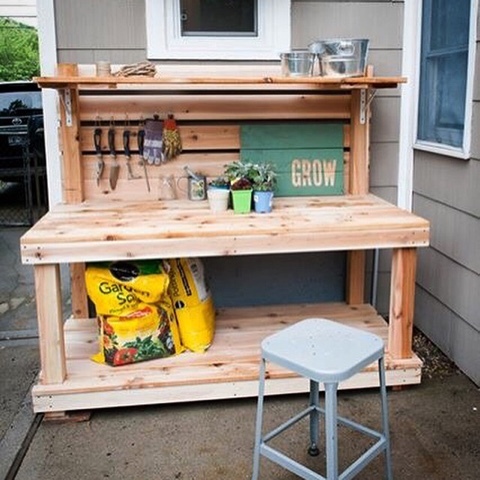 Potting Bench / Outdoor Bar : Buy or Build? I've really wanted to make something similar for the space under my deck stairs that is currently used as a catch all but I'm torn about buy vs. build. If we build, we can make it fit the space better and perhaps save a tiny bit of money but of course its a lot more work and the outcome might not be as finished as I like. I'd love to get some opinions! Everything you make looks like a million bucks, and I think you will like being able to customize it to your specific needs. Go for it! Its a fairly simple project, you can get it exactly the size you need / customize it, and its going outside so any imperfections from it being a DIY will be part of its charm! Build. Not for pride; potting benches get a lot of wear and tear between use and being outside. If you make it you can always fix it easily if you buy it... I just can't believe it will be as sturdy. There's nothing wrong with prioritizing how you spend your energy. Maybe this is a good buy this time. My bet is you have a million and one things on your plate. Build! I made two of these: http://www.ana-white.com/2015/04/free_plans/ryobination-potting-bench I adjusted things a bot to make it taller ((i'm 6'1") and placed the top slats ext to each other to give me a flatter surface. I love them! I'm not experienced and it took me maybe 2 hours to assemble. Hello my friend! 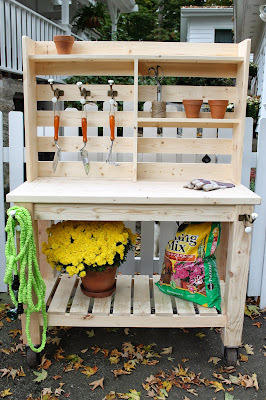 I did both, I bought for one space (that SAME potting bench and I LOVE it although it takes a few hours to assemble) and we also built a version of the BHG potting bench which took a few hours but still works for us as a bar and a potting bench, check it out here! Either way, you'll be happy!